StopTech Big Brake Kit - Touring - Brakeswap.com - Friction for the Win! StopTech Touring Big Brake Kits are the ultimate in 1-piece rotor brake upgrade systems and represent the best performance value in the StopTech lineup. 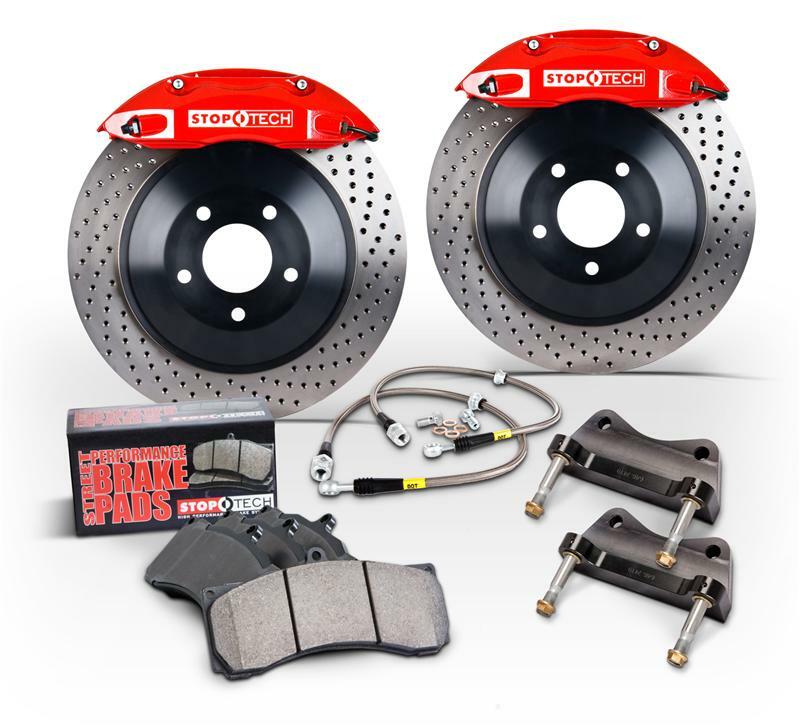 They offer nearly the same performance as the StopTech Big Brake Kits and Trophy full race systems at a more affordable price point. Designed for street driven production vehicles, StopTech Touring Kits include forged 2-piece calipers, larger 1-piece rotors, StopTech Stainless Steel Brake Lines, StopTech Street Performance Brake Pads and application-specific caliper brackets. The stiff 2-piece, fully-forged calipers have designated piston sizes specific to each application and provide a firmer, more responsive brake pedal that provides better brake pedal modulation. Depending on the application, Touring Big Brake Kits are available in two-, four- and six-piston configurations and 5 different caliper colors that use a special high temperature paint to withstand extreme conditions. All StopTech Touring Big Brake Kits include stiff calipers that utilize silicone dust boots to extend service intervals. The larger 1-piece rotors, available in Power Slot slotted, or StopTech SportStop drilled and drilled/slotted finishes, provide greater heat capacity and reduced brake fade. Also assisting in fade resistance and higher performance are the StopTech Street Performance Pads which have a high maximum operating temperature, and high bite for responsive brakes that can be driven hard. Carefully engineered, 2-piece design reduces flex. The carbon steel caliper bolts running through both halves multiply strength by 3-fold.